When building service personell serviced the two urinals in my office they went above and beyond the usual valve repair or drain clearing. 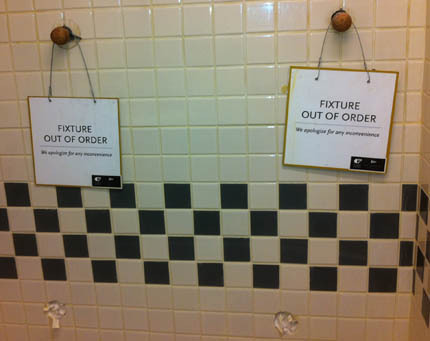 Have a look at the understated signage hung during urinal ‘maintenance’ a few weeks ago. Yes, they removed both the urinals from the wall and hung these signs to ensure we didn’t piss on the walls. But we pissed on the wall anyway, which is probably why they never remove the toilets.